Shut up and move with me, move with me, or get out of my face. - Wombats, "Techno Fan"
When I announced Afton would be my last race, due to endless injuries and illness, few believed me; those who did expected I'd go out with a bang - either that I was sandbagging and ready to go for a top finish, or I'd put on an epic battle, running on when no one else would consider continuing. There was a part of me, too, buoyed by the exhilarated expectation of racing, that thought, maybe, just maybe, there was one last fight left in me. I hadn't run in three days, as my heels and Achilles tendons had started to hurt again. The fact that we'd gone from the coldest rainiest spring to hot and humid those three days helped me feel better about this forced "taper" from three weeks of mediocre training after three weeks of illness. This was the year of the Minnesota government shutdown. A month earlier, I had alerted the race director, John Storkamp, to the possibility of the park being closed and a need for a contingency plan. I looked at the possibility of using county parks or the Wisconsin state park across the river; moving to the local roads proved an impossibility. A week later, John said that the Afton Alps ski area adjacent to the park would let the race be held on their mountain bike course. The Alps have always been a good neighbor to the park and they deserve special recognition for making this race possible. John and his volunteers had to measure and mark a course at the very last second. Until you've worked behind the scenes at a race, you can't imagine how hard it is to make a race look seamless. I had snuck onto the bike trails once or twice and had seen a small section of them. I'd done some training on the Battle Creek mountain bike trails and was trying to remember trying to learn how to ski at Afton some 40 years earlier. I thought I knew what to expect, but one glance at the ski hill turned "hilly" into "HILLY." It's always hot in Afton in July, but the ski hills would have no shade. The air was fairly thick with humidity, but it was expected to dry quickly that morning. I wasn't ready for the weather, but knew proper hydration and sunscreen (which I remembered for the first time in 6 or 7 Afton races) would help. I heard there'd be one aid station at 4 miles of the 7.75 mile loop and quickly figured that one 20 oz. bottle would be enough, though the number of people with hydration packs had me worried. Before the race, I got to see a lot of people I hadn't seen in a year or two. That's why I came to the race: to see people I really should see more than once a year. Les Martisko was there, wearing his 1983 Twin Cities Marathon shirt - it didn't have a year on it, but I have the same shirt. A lot of people were good-naturally joshing me and a few introduced themselves (including one who said, "I read your stupid blog." For that, he gets an anonymous mention). We got to the starting line and I made it a point to move back in the pack until I was with people who looked like they were in way over their heads, yet I was only a couple of steps behind Alicia Hudleson, who I expected would do fairly well. The plan was to go out slow, knowing this would be a war of attrition where my usual jackrabbit start would be suicidal. John said "Start." There was a moment where everyone simultaneously thought: was that it? Not a gun, or "Go!" but "Start." The first quarter mile was through the parking lot and the access road and would prove to be the only flat section of the course. We headed into the woods, where a bottleneck slowed everyone to a halt. I knew it was possible to pass on single-track trail, so I banged through the brush, startling those I passed. I was instantly 30 places ahead of where I'd been, but that also meant that I was now running with people I expected to finish an hour or two ahead of me. My "start slow" plan lasted all of 5 minutes. The very beginning of the trail had a surface I'd never previously encountered on trails - rubber. It was a section prone to erosion, but not suitable for wood to shore it up. It was my last race and I had something new! I expected my shoes, wet from a big mud puddle we had to run through, to slip on it, but I was fine. My heels hurt, though. I found myself running behind Valeria LaRosa-Shuster - and to beat jokesters to the punch, yeah, there are worse things than running behind Val - so I told her I was behind her and that that meant I'd gone out too fast. She, of course, demurred. We nearly got trampled by two deer and I asked her what the Spanish word for "deer" is, it never being a word I needed to know and Spanish being her native language. "Ciervo..." she said, "ciervo" - though I heard "ciejo" and just now looked it up. I'd see two more deer (or the same ones) later in the first loop. The first hill was switchbacks across open field between two shaded areas that concealed service pipes and electrical works for the chair lift, which was only occasionally noticeable. On each turn there was a choice of cutting close and going over rocks or swinging wide to go over smoother ground. With each turn, my heels hurt more. As long as there weren't many sharp turns downhill, I might be able to keep the pain tolerable. Unfortunately, there followed switchbacks down (and up and down again) before entering the open prairie. Though I didn't think of it at the time, the humidity was already dropping as the sun became a factor. Going over the mowed prairie on the hulls, I sometimes got overwhelmed by the smell of rotting vegetation, a sour vinegary smell. I had chosen the wrong shoes for the day; after they'd get wet in the dew, my toes, making a clawing motion that happens without my thinking about it when on hills, folded the insoles over double. It was awkward, to say the least, but it'd have to right itself or I'd just live with it. I hit the first aid station about 40-45 minutes and refilled my water bottle with HEED. I swear that I should provide races with my own homemade solution. I nearly gagged - and HEED is the least objectionable electrolyte replacement drink [that should be their motto: least objectionable] - and decided it was going to be a water-only race for me from that point for me. Shortly after that, going up another hill, Helen Lavin was taking photos and I finally got a chance to congratulate her on her Black Hills 100K victory. I was slowing 30 seconds per mile each and every mile. The course went up to the top of the ski hill, then downhill in the least memorable part of the course, up a long hill where you can see people far ahead of you going down (it's deceptive: you think you'll get there long before you do). Then it's downhill and then back up what you're sure will be the longest hardest hill of the course - just as you were sure the last one would be - then a long descent that's fast and even fun, where you see people standing at the bottom and you're sure you're about to finish the loop. Looking at my Garmin Forerunner, I saw there was almost two miles to go. It was heart-breaking. The next section is by far the steepest hill, garnering comparison to Voyageur's "power lines," and Jen Pierce was taking photos at the top, able to carry on conversations with runners for a ridiculously long time. Then there was one last downhill, with a very steep "bowl" in the middle, which tore my Achilles to shreds. 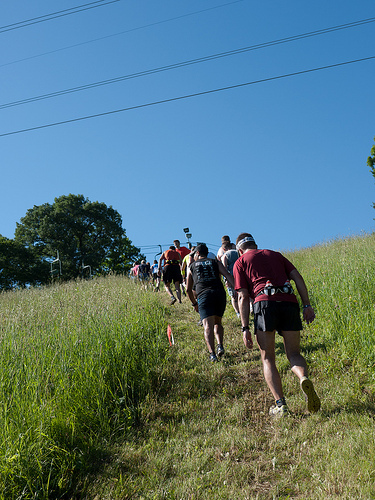 I later heard that the course averaged 250-300 feet of climb per mile. I crossed the timing mat (just over 90 minutes) and refilled my water bottle at the aid station. I considered very seriously quitting right there and then, as three more loops would be torture. I figured I could stop at any time, so starting one more loop would be okay. We'd see how it went. I finished loop 2 in 3:08, so I hadn't slowed down much, but I'd done it knowing there wouldn't be a third one. I turned in my timing chip to John Drew, got some water and headed for the picnic tables in the shade, where I had some conversations, including one with a woman who'll remain anonymous, as she works with triathletes and said snobbish triathletes are ruining trail races (I'm hoping we're slowly changing them, myself). When I felt better, I headed back into the sun to see who was around and I got asked how I was doing. "Fine," I said - and I meant it - and then I got light-headed. "Maybe not." I sat down. It got worse. I laid down. I knew the next step would be my eyes rolling back and going unconscious, so I fought it and started to sit up again, when I heard "Let's get you in the shade" and I was being carried under the arms back to the picnic tables, where I was fine again in 2-3 minutes. Heat's tricky like that. I wouldn't have survived two more loops, so I'm glad I DNF'ed - "Did Nothing Fatal." Two days later, on the 4th of July, I started my retirement by volunteering at a race by my house I'd only learned of on the 3rd. I'd been assigned the impossible task of setting up an aid station in 5 minutes and manning it single-handedly. One of my neighbors, out for her morning jog, stopped to help me out. [Thanks, Margaret.] That's the sport of running at it's finest. That's the happy ending I 'd been waiting for. I wanted to let you know, I checked the rule book thoroughly, you DO NOT have to always chose the hardest courses, nor the longest distance offered, nor do you have to barf out a lung, carry your own leg into the aid station, or lose more than 20% of your total blood volume to drop in a race. I thought that might be useful information as you go forward in your "retirement." @RBR: The "did nothing fatal" is in ultras akin to "A priest, a minister and a rabbi walk into a bar..."
Want some revenge at Afton Alps and only have to do a 5K? October 1 - 2100+ vertical feet of elevation - 5K or 10K. Oh! I forgot to suggest checking for trigger points in your calves - especially the soleus, gastoc, and tibialis posterior. Frequent cause of referred pain to the heel that often mimics plantar faciitis, Achilles teninitis, retrocalcaneal bursitis, bone spurs, etc. Ridiculously common in runners! Happy ending? I would've expected your happy ending to include something other than a woman helping you out at an aid station. Good one, Anonymous. Didn't occur to me, as Margaret's 70 years old and I was a bit tired from the race and partying on Saturday night. Nice meeting you Steve. Kudos to anyone who completed even one loop of that course. I do have one regret, though. I didn't get to taste the fudge from Steve's Evil Kitchen. I'm so sorry I didn't get to meet you at Afton! What a report -good description of those last cruel, evil hills where we all thought we were finally coming back to the starting line only to be painfully disappointed. You definitely made an intelligent choice in shutting down. Hope the injuries heal up soon! Well, it wasn't quite the bang you wanted to go out with, but that Wikipedia citation means that you will be a source of misinformation to tens of people for hours to come. Why not change the J.Q. Adams Wikipedia entry to make him a Founding Father so your Congressional Teatard M. Bachmann won't seem like a fucktard for the numerous times she's insisted he was one? Go ahead! I won't begrudge you! There's plenty more evidence to prove she's a fucktard. But ... is it possible she might some day be Madam President Fucktard? Well, it is if you change her Wikipedia entry to say so! Sorry to hear that your last race didn't go the way you had hoped it would. On the other hand, it sounds like you made the right choice to stop when you did. That course elevation map looks so evil. And I loved your comment about HEED. I'll have to try the "least objectionable" option at some point. Let me chime in as a recreational runner, who almost never runs races. Running just to run really can be amazing. Hope you enjoy retirement. 70 years old? Nothing wrong with "partying" with her, right? Hell, don't retire until we get a chance to meet. I'm just a running bum. Get out about 5 days a week and run an ultra 2-3 times a year. All the tools aren't in the box anymore, but the vice grips and crescent wrench are still in there. Not sure where the hammer wandered off to, but it was getting tough weilding it around anyhow. You mean you did not check out your self portrait of you on the back of my neck when I passed... Guess you'll have to wait until half voyageur or some other race. All training for hopefully a strong marathon. We had really been curious what would happen with Afton with the Minnesota shutdown. Ski hills it was, I guess! No electrolyte drink - and I imagine you didn't take salt tabs either - in such hot weather sounds like an explanation for your light-headedness. But it seems kind of pointless to give advice after your retirement. Plus, I'm sure you know anyway. Thanks for the report! SQ, you've retired and unretired more than Brett 4avre! Wow, the elevation chart is simply insane and, no doubt, the weather conditions only made the already brutal course, more brutal. Although I don't know Valeria LaRosa, I have heard her name bantered about in trail running circles. 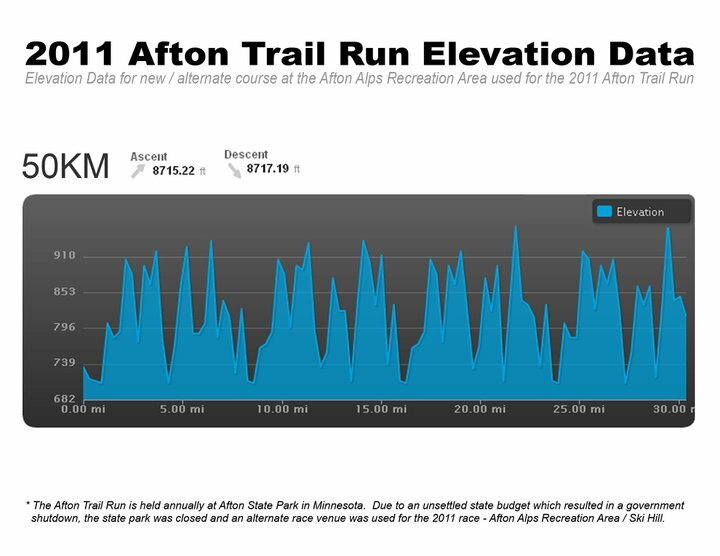 I noted that her average pace was 90 seconds slower at the Alps compared to Afton State Park last year. I can't imagine how difficult that course must have been in those conditions! Wow! Steve, if you are indeed retired, I hope you keep writing on your blog. Thanks for all of your insight and contributions here. I have learned a lot and have very much enjoyed your writing! My boyfriend coaches skiers at Battle Creek, and indeed it is HILLY with capitol letters! I'm also glad you DNFed, because I don't think it'll be your last! BTW, I still want your sports drink recipe. Steve! What's this about your last race? Granted, Afton is one hell of a way to go out! Get healthy!